Hi there, At The Picket Fence friends! It’s me, Claire, from A Little CLAIREification, and I am so excited to be here. I recently had the great pleasure of meeting Heather and Vanessa in person at the SNAP conference a couple of months ago. They are just both so beautiful, inside and out, and I am thrilled to be part of the ATPF contributor team. I am a working Mama to three amazing boys and I love bringing my readers “bright ideas on a budget”. Many of those ideas involve food since I love to cook and bake so much. I am admittedly addicted to cheese (I am not ashamed) and I also hoard washi tape and Sharpie markers in every color known to man. 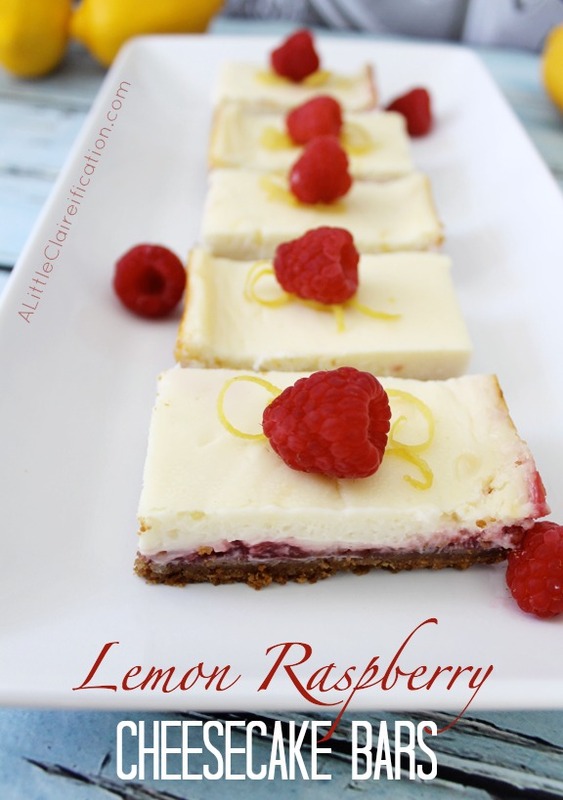 Now let’s get to these delicious Lemon Raspberry Cheesecake Bars! First, I know some people get intimidated at the thought of making a cheesecake and honestly it really isn’t that hard at all. You got this! Depending on your cost for the cream cheese and raspberries, you might even have most of the ingredients on hand so it won’t break the bank either. Just follow the easy steps in the recipe below and your family and friends are going to love the tangy lemon and fresh raspberry combination. I am not sure which part is my favorite – I like a little crust in every bite, for sure. I hope you enjoy the recipe and cannot wait to see you all again next month. Thanks again Heather & Vanessa for including me as part of your amazing team! until you have the texture of bread crumbs. Bake in the oven for 12 minutes until golden brown. In a small saucepan, whisk together the sugar and cornstarch. Add the raspberries and turn the burner onto low. Stir the raspberry mixture once it has cooled. It should have a smooth consistency. Pour onto the cooled raspberry covered crust. until the center only slightly jiggles. completely before refrigerating for at least 3 hours. 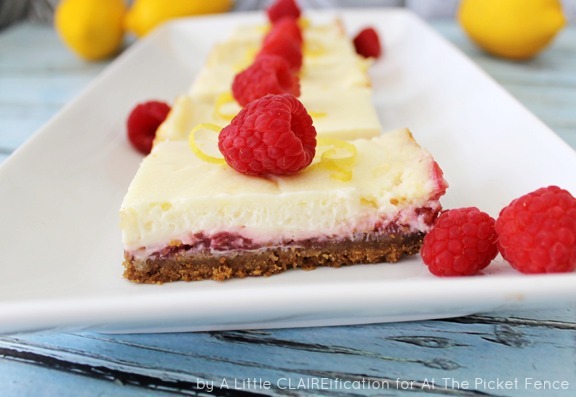 6 Comments on "Lemon Raspberry Cheesecake Bars"
My favorite cheesecake at Cheesecake Factory is their lemon raspberry…and this is a recipe that I have to try!…thanks for the great recipe of my favorite taste combination!! This sounds so yummy! I’m going to pin this recipe, so I can find it again easily. Thanks for sharing! Oh I love lemon anything! And raspberries too…yum. So pinning this!!! 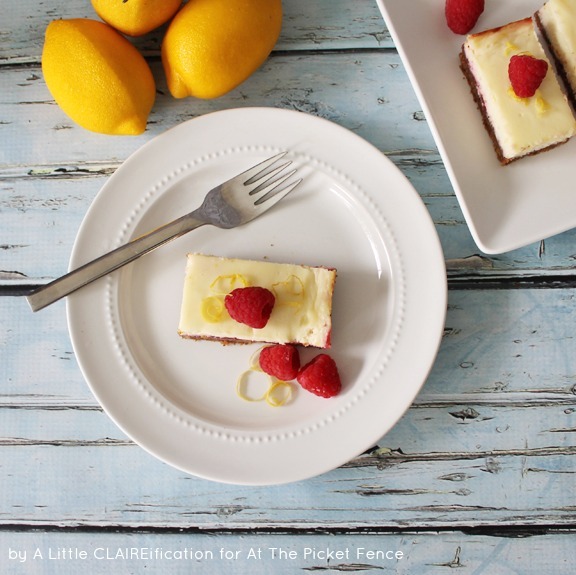 Let’s see…I’m a fan of cheesecake, raspberries, lemon, and Claire! So this works for me! Sounds delish, and pin-worthy!